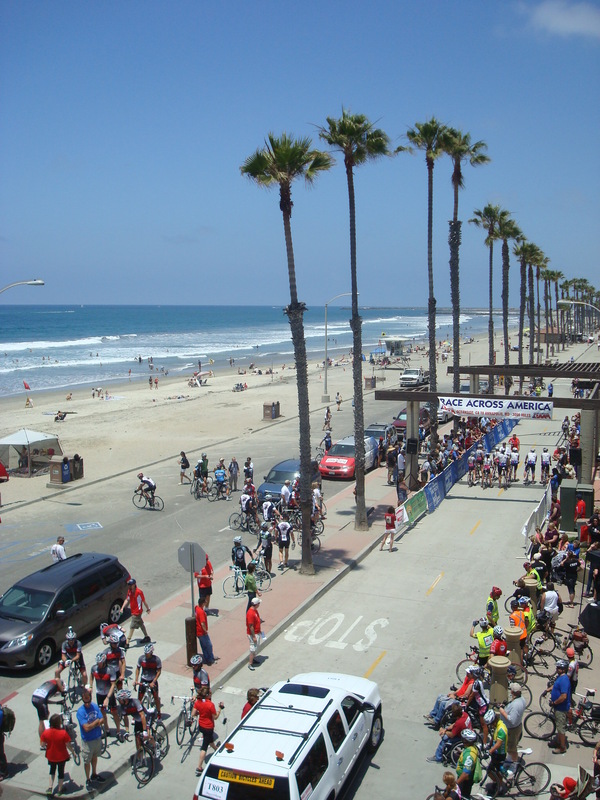 Last Saturday, I dragged my daughter down to the Oceanside Pier to see the start of the Race Across America (RAAM) bike race. I had no idea what to expect. I felt like a real live journalist, though, in search of a story. So, I found clusters of bicyclists in spandex with their sleek bicycles, all waiting for the beginning of the race. You can follow the progress of the team here. The team is racing for great cause. They’re raising money for the Akron Children’s Hospital. This charity is a good fit for SenseAware® because it allows healthcare providers to monitor critical shipments, the kind that can help save the lives of the very children that Ohio CycleWorks is riding to support. As we were waiting, Grace and I sat on a grassy hill near the start of the race. A very tall man was called to the microphone and introduced as Bill Walton. I said to Grace, “Hey, I think that guy is a famous basketball player!” Grace was unimpressed. However, I realized that we were in the presence of a celebrity athlete and I joined the throngs taking pictures of him. He was with the man who founded the race in 1982. Back then there were only four riders. Now there are over 300 riders crossing 3,000 miles from Oceanside, California to Anapolis, Maryland. So I snapped this photo of Bill Walton. Do you know who he is? He’s 6’11” tall, just in case you wondered. Finally, I found the Ohio CycleWorks team. I felt a little shy, though–how would I explain this blog-article?–and so I took a picture of the back of their jerseys. See at the bottom? You can see the FedEx logo. We cheered as riders left thirty seconds apart. The guy with the microphone asked each team quick questions, then off they pedaled, followed by their support van. I wanted to see “my” team depart, but unfortunately, the 8-person teams were launched last and we had to get to soccer. The whole experience really made me want to buy a bicycle. When I was fourteen, my stepmom took me and my brother and sister on a bike ride down Highway 101–from Seattle to San Francisco. We only rode 1,000 miles and it took us five weeks. That was one of the defining adventures of my life. I miss riding a bicycle. It’s crazy how fast the teams go. I’m loving keeping up with the Race both using the SenseAware® technology and through Facebook. To think that we got to see them at the starting line . . . how lucky was that! 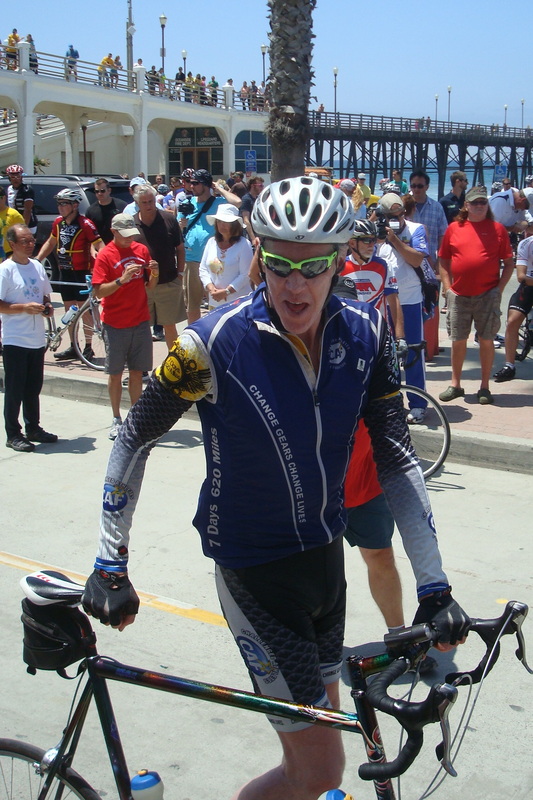 Oh–and I have to say that I was so impressed and amazed by some of the Wounded Warriors who were riding . . . a couple of guys with only one leg and one with no legs at all–and other injuries, seen and unseeen. What a picture of determination and grit. 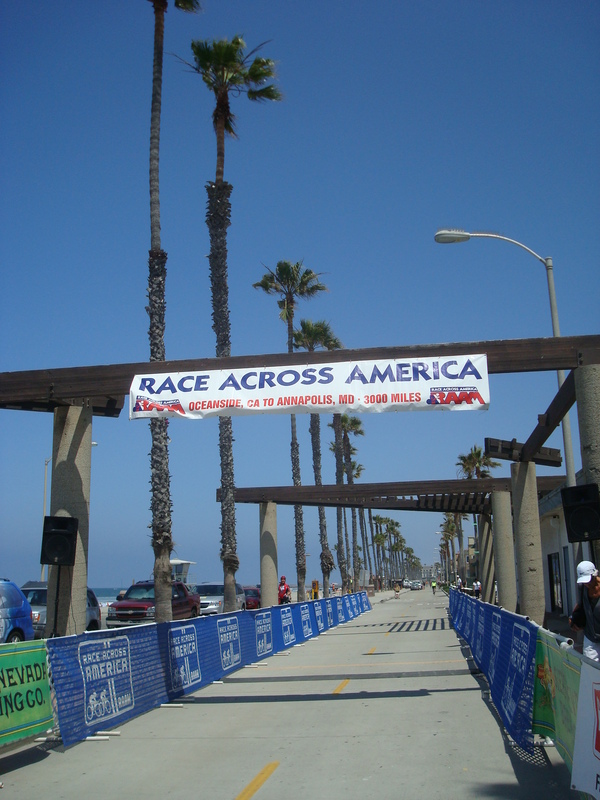 Most teams will finish the race in about eight days. ← Where in the world is Nik Wallenda? Oh yeah…I do remember Bill Walton. I am so glad he finally learned how to clean up and look presentable once he became a basketball commentator. In his college/early pro years he was still a hippie-wanna-be and didn’t stay very clean hygienically…or so I always heard, lol! What a legacy to follow you around, eh? 1,000 miles on a bike?? Wow!! You should definitely go get yourself a bike!!! That just blows my mind – and I can see how something like that would be a defining adventure! Impressive!! You have a team in the race? So do I! The head of oncology where I work founded an organization that takes cancer survivors on adventures – Mount Everest, Mount Kilimanjaro, and now the Race Across America. It is so inspiring. Their website is here: http://aboveandbeyondcancer.org/ . You got some good pics! And about: “We only rode 1,000 miles and it took us five weeks.” — WOW! That’s very cool. I remember Bill Walton although I probably don’t know too many basketball players after his era. In fact, I remember him more from his college than pro endeavours.